Call the castle, and call Aunt Sue! On Purim, we remember the heroic actions of Queen Esther, who took a stand against evil and reversed the plot of an evil man who planned to persecute and annihilate the Jewish people. Esther didn’t just write an op-ed, organize a petition, or take to the streets. She went to her husband and asked for his support and his action. Her quiet diplomacy with the person closest to her ultimately changed the fate of the Jewish people. Starting this Purim, we have the opportunity to #BeEsther and stand up to anti-refugee sentiment, bigotry and fear among our friends and family. There has never been a more critical time to take a stand on behalf of those who are persecuted today, the world’s 65 million refugees and displaced people. As you continue to “call the castle” to advocate to our administration against their devastating continued efforts to bar refugees from coming to the United States, HIAS also invites you to “call Aunt Sue” by committing to have at least one conversation with a family member, co-worker, or friend on behalf of today’s refugees. 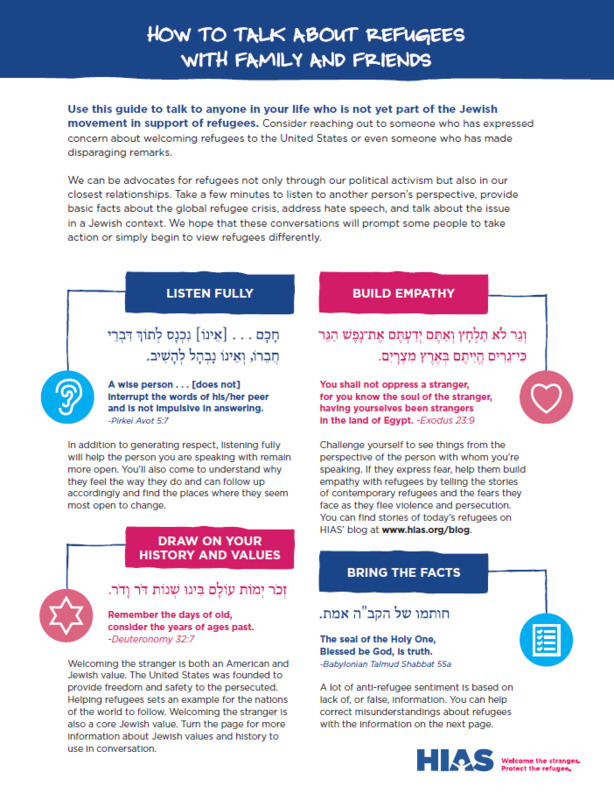 Download the guide below for pointers about how to #BeEsther this Purim and talk about refugees with those closest to you.